Dept. 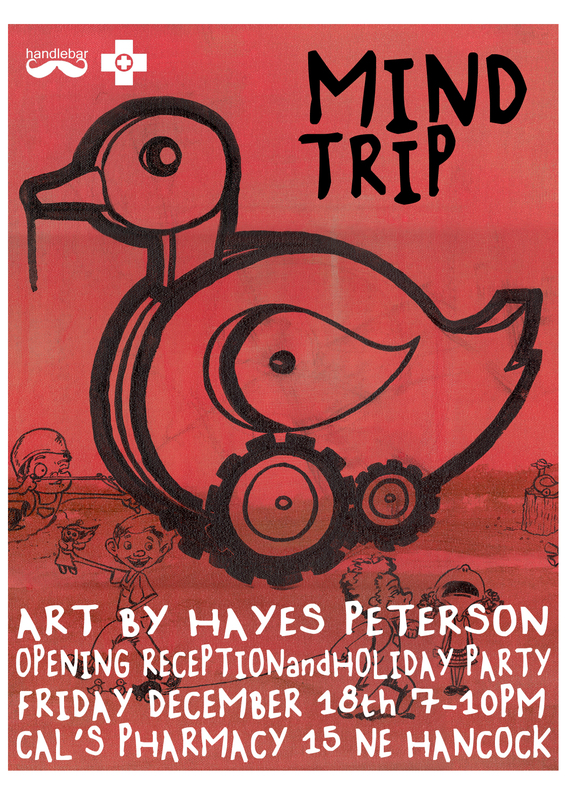 of Skateboarding » Blog Archive » Hayes Peterson’s “MIND TRIP” show opens Friday 12/18 @ Cal’s Pharmacy!! Hayes Peterson’s “MIND TRIP” show opens Friday 12/18 @ Cal’s Pharmacy!! Hayes Peterson’s “Mind Trip” opens at Cal’s Pharmacy December 18th 7-10pm. Since this show is opening only a week before Christmas we decided to make it our Holiday Party too. Hayes is very near and dear to our hearts and probably many of yours as well and has been a humongous contributor to the goodwill involved with both Cal’s Pharmacy and The Dept. for more than a decade. We’ve been pretty fortunate to have a lot of great artists show with us this past year such as Bryce Kanights, Dave Carnie, Jo Jackson, Andy Jenkins, Chris Johanson, Jason Lee, Chris Pastras, Clint Peterson, Russ Pope, Roger Seliner, Tobin Yelland and Ashley Anson. We are super excited to wrap up 2009 with Hayes Peterson’s first solo show. So be there or be square or be there AND be square.. or be like most of the locals and damage your liver. Look forward to seeing you. Posted on Thursday, December 3rd, 2009. Hayes is easily one of the coolest people alive. « TOBIN YELLAND “UP” PHOTO SHOW OPENING SAT. NIGHT 9/19! !